As promised, I’m working on keeping up with my blog a bit better, at least for a few weeks… when my baby is born, all promises are out the window 😉 though I hope to still have lots of stamping going on. 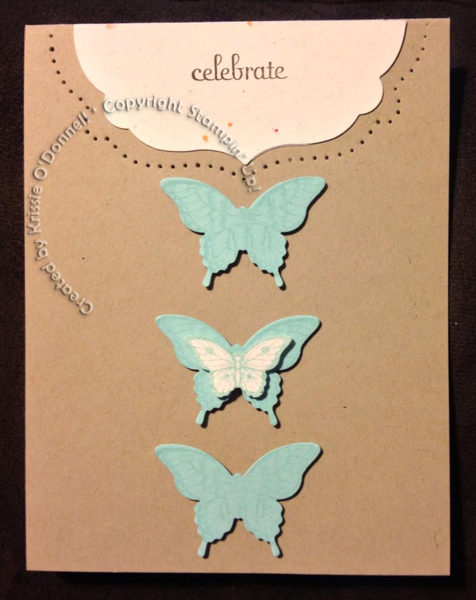 Here’s a card that was inspired by a project in the demonstrator-only magazine “Stampin’ Success.” When the Spring catalog came out I was really excited to step up this card with the smaller butterfly punch image. I love that we have a punch for both butterflies in the Papillon Potpourri set now. Love that set, I’d say its my favorite that we have. I also finally got to use my paper piercing templates that coordinate with lots of our framelits and punches. There are 3 available now, and I’m sure that as our punches and framelits collection grows, we’ll have more piercing templates to complement them. Accessories: Elegant Butterfly Punch, Bitty Butterfly Punch, Framelits Labels, Piercing tool, Piercing mat, festive paper piercing template. ← Its been too long!